A refreshing bowl of salad is always a healthy choice for a healthy breakfast or a snack. A delicious salad can be made in just a few minutes. Chop some tomatoes, cucumber and onion. Combine and season with salt and pepper and tadaaa...a healthy salad in no time. 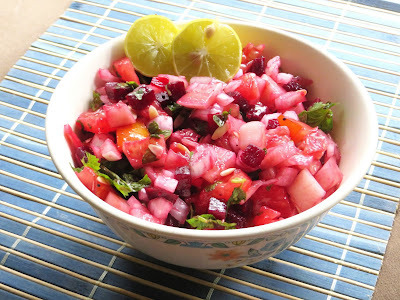 Here is a quick salad that is healthy and tasty as well as colourful. I have added beets to the regular salad that gives the salad an eye catching colour. Its a vegan salad. Wash all the ingredients. Organic vegetables are preferable. Peel the beetroots and pressure cook for 3 whistles. When the beets are cooked, dice the beets and keep it aside. Alternatively, peel the beets, dice them and cook in medium flame adding adequate water. Transfer the cooked and diced beets to a large mixing bowl. Peel the cucumber skin and dice it. Add it to the mixture. Cucumber seeds are edible and have healthy benefits, so do not discard the seeds. Mix the content and squeeze juice of one lemon. Add required amount of salt and pepper. Mix well. Garnish with chopped coriander leaves/cilantro. Fresh, simple and healthy salad is ready to be served. The colour of the salad is red due to the addition of beets.